Barnes & Noble, Inc. today announced the launch of NOOKcolor by Barnes & Noble, the ultimate reading experience — the first full-color touch Reader’s Tablet that delivers digital books, magazines, newspapers and children’s books in immersive, gorgeous color, and all in one beautiful, thin and highly portable device. NOOKcolor is now available for $249 for pre-order at www.NOOKcolor.com and at Barnes & Noble stores tomorrow, and will begin shipping on or about November 19. Touch the future of reading at a NOOK Boutique or display at your favorite Barnes & Noble bookstore, as well as at Best Buy, Walmart and Books-A-Million starting late November. The first full-color touch device dedicated to reading everything and built on Android, NOOKcolor opens up a whole new world of digital reading materials of all kinds, in addition to providing access to the largest bookstore with an unprecedented selection of over two million digital titles a single search away. Digital content — from bestsellers to favorite magazines in full color, and interactive children’s picture books and enhanced cookbooks — has never looked better than on NOOKcolor’s stunning 7-inch VividView Color Touchscreen. Building on Barnes & Noble’s nearly 40 years of bookselling and publishing expertise, the company quickly became a leader in the digital arena following the introduction of its award-winning, bestselling NOOK devices, popular free software and expansive digital bookstore last year. This newest addition to the NOOK device family was designed for people who love to read every kind of content imaginable — and features 8GB of space, plus expandable memory, to store it all. NOOKcolor enables quick and easy shopping and book downloads in seconds over Wi-Fi®. NOOKcolor is also the most social reading device ever built — with Barnes & Noble’s new NOOKfriends technology, you’re only touches away from sharing with friends via Facebook®, Twitter® and email. NOOKcolor offers all the content you love, at your fingertips, experienced like never before, through Barnes & Noble’s newly expanded NOOKbook Store. Shop over two million titles: NOOKcolor provides access to the most expansive digital catalog available so you can browse more than two million books, enhanced books, newspapers and magazines, engaging children’s books, and other interactive content in a single search. Find classics, new releases and bestsellers, including 194 of 205 current New York Times Bestsellers. Sample NOOKbook titles for free and download all content wirelessly in seconds. Since the launch of PubIt!, Barnes & Noble has also added thousands of titles from independent publishers and self-publishing authors. NOOKnewsstand — periodicals in vivid color: From The Wall Street Journal, The New York Times and USA TODAY to Rolling Stone, Esquire, US Weekly, National Geographic, Martha Stewart Living, Cosmopolitan and Elle, NOOKcolor customers will find an impressive and growing list of the best daily, weekly and monthly periodicals, all optimized for the device in rich color. Magazine reading is easy and engaging with full-color pages and Barnes & Noble’s exclusive ArticleView puts the focus on the content, customized to your favorite reading style. Periodicals, available by subscription and single copy, will continue to become even more interactive next year. NOOK kids experience: For the first time ever, enjoy the largest collection of popular children’s picture and chapter books in an engaging digital form through the new NOOK kids offering. Through exclusive AliveTouch technology, your child can interact with words and pictures, easily find a favorite story, and even have some read aloud to them. Enjoy a broad and growing selection of more than 130 digital picture books — an unprecedented offering that will double before year’s end — and nearly 12,000 chapter books for children, plus exciting enhancements coming soon. Learn more at www.NOOKkids.com. Enhanced and engaging titles: Coming soon, NOOKcolor customers will also enjoy a growing collection of multimedia titles offering instructive video and audio to learn about travel, cooking, music and more. Great reads, great prices: The vast majority of titles in the Barnes & Noble NOOKbook Store are $9.99 or less, including most current New York Times Bestsellers. 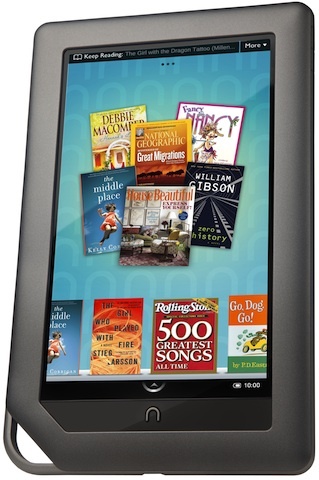 In any Barnes & Noble store, read NOOKbooks for free through the company’s innovative Read In Store program. On any given day, peruse as many books as you wish, for one hour per title. And enjoy more than one million free classics and even more free reading by checking out additional titles from public libraries. NOOKcolor makes it simple and reflexive to get social about reading. In another industry first for Barnes & Noble, the new LendMe App enables NOOKcolor users to view LendMe books in their friends’ NOOKcolor digital libraries and request to borrow a title they’ve been meaning to read. Customers have the ability to easily lend their favorite NOOKbooks with friends through Facebook and email, even using their imported Google® Gmail contacts, and recommend a title, share reading status or a quote via Facebook, Twitter and email. Barnes & Noble recognizes the uniquely personal nature of reading and designed NOOKcolor to be flexible and highly customizable, so each customer can truly make it his or her own. Simply more than a touch of fun: Everything you want to do is simple and intuitive. Shopping for new content, finding and reading titles in your library and customizing the way you view your content are all a touch or two away. With a simple tap of the screen or swipe left or right, book pages turn in a flash. Personalized reading experience: Experience the flexibility and fun of completely customizing your reading experience. Choose what titles will appear on your home page and Daily Shelf, organize and view your library your way, find the right text type, size and color theme that’s right for you, and read in portrait or landscape. All your content at your fingertips: Your entire library is always a touch away with 8GB of memory. That’s approximately 6,000 NOOKbooks or a combination that might include 1,000 books, 25 full-color magazines, 10 newspapers, 50 kids’ books, 500 songs and 150 photos. Plus, NOOKcolor has expandable memory using a microSD card. And with Barnes & Noble’s Lifetime Library, existing customers of NOOK products and software-enabled devices will instantly be able to access their personal Barnes & Noble digital libraries on NOOKcolor. With this digital library advantage, Barnes & Noble ensures that your content always goes wherever you go and is always protected and accessible on a variety of devices, as well as BN.com. NOOKbook Personal Shopping: Barnes & Noble offers exclusive, personalized book recommendations from its expert booksellers, based on the genres, authors and subjects you like. Continuous reading experience: Read NOOKbooks seamlessly across your NOOKcolor, NOOK 3G and Wi-Fi devices (following a NOOK firmware update in late November), third-party eBook Readers powered by the Barnes & Noble NOOKbook Store, and your favorite mobile and computing devices enabled with free NOOK software. These include iPad, iPhone®, iPod touch®, Android smartphones, and Windows-based PCs, laptops or netbooks. NOOKcolor syncs last page read, highlights, notes and bookmarks. 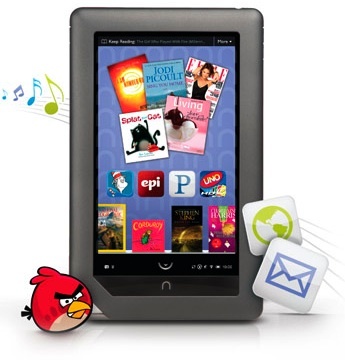 For more information on free NOOK software, please visit www.bn.com/NOOKapps. View your personal files: Transfer and view personal PDF and ePub files to NOOKcolor, as well as JPG, PNG, GIF and BMP files, and use personal photos for wallpaper. With Quickoffice® software, view Microsoft® Office files including Word, Excel and PowerPoint. Punctuate your style: Read in style with a full line of exclusive NOOKcolor accessories from Barnes & Noble, including covers with rich Italian leathers, European broad cloth and more from leading designers kate spade new york, JACK SPADE and Jonathan Adler coming soon. To create the most exquisitely designed dedicated eReading device on the market, Barnes & Noble worked with award-winning industrial designer Yves Behar at fuseproject. NOOKcolor’s elegantly simple design in classic graphite features an angled lower corner that evokes a turned page, along with a beaded border and lustrous, soft-touch back that make holding NOOKcolor comfortable and pleasurable. No other full-color touch reading device is thinner or more beautiful. VividView Color Touchscreen: NOOKcolor features a best-in-class 7-inch color touch display like nothing you’ve ever seen before, particularly on a dedicated reading device. The screen displays more than 16 million colors and offers a wide viewing angle for personal or shared reading. The special design provides enhanced color tuning, gradation and reduction of glare to reduce distracting reflections. Wi-Fi connectivity: Easily connect to personal and public Wi-Fi hotspots as well as free Wi-Fi in Barnes & Noble stores to shop the Barnes & Noble NOOKbook Store and download content in seconds, surf the Web, stream music and more. Lightweight and portable: The compact device fits easily into your purse, jacket or bag at 8.1 inches (height) by 5 inches (width) by 0.48 inches (depth) and 15.8 ounces. 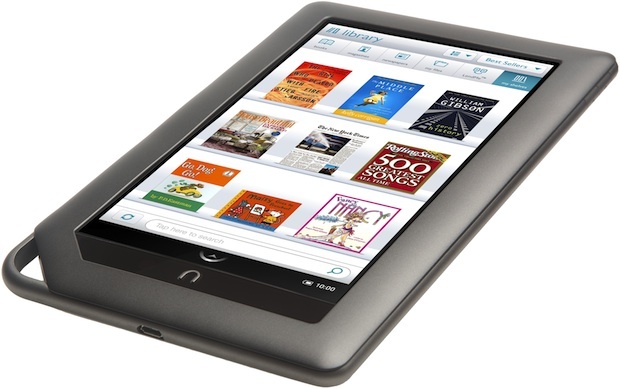 NOOKcolor offers many extras with fun and useful additions to the reading experience. Game on: Enjoy fun and free games on NOOKcolor, including crossword puzzles, Sudoku, chess and many more to come. Listen to music while reading: Stream tunes from your favorite artists over Wi-Fi with Pandora® internet radio’s free, personalized music service. And load your MP3 and AAC songs to enjoy music while reading anywhere using the built in 3.5mm headphone jack or speakers. Surf the Web: Over Wi-Fi, use a full browser to visit your favorite Web sites, check email, and more. Fun and free in-store features: In Barnes & Noble stores, connect to free Wi-Fi to browse and read the content of complete NOOKbooks for free through Read In Store, which features enhanced performance for NOOKcolor, including instantaneous page turns. And download exclusive content from bestselling authors and enjoy special promotions and discounts through the More In Store program. More extras coming: Get ready to discover more engaging content and applications in the coming months. Barnes & Noble invites content providers and application developers to create innovative reading-centric experiences through the just-announced NOOKdeveloper program. NOOKcolor is available for pre-order for $249 and is expected to begin shipping on or about November 19, making it the perfect holiday gift for people who love to read everything. Experience NOOKcolor today at www.NOOKcolor.com or at the NOOK Boutiques and displays in one of Barnes & Noble’s more than 700 bookstores beginning in late November. Barnes & Noble’s 45,000 knowledgeable booksellers will provide walkthroughs of the entire family of NOOK eReading products and free software. 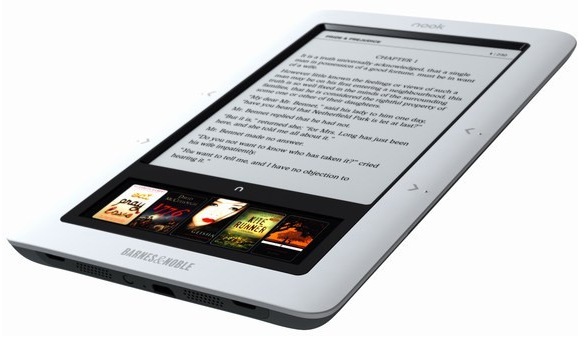 NOOKcolor, along with NOOK 3G and NOOK Wi-Fi, will also be available at Best Buy, www.bestbuy.com, Walmart and www.walmart.com, and Books-A-Million in late November. For book lovers who crave a paper-like reading experience, NOOK continues to be the most full-featured dedicated E-Ink® device on the market at a great value, starting at $149. 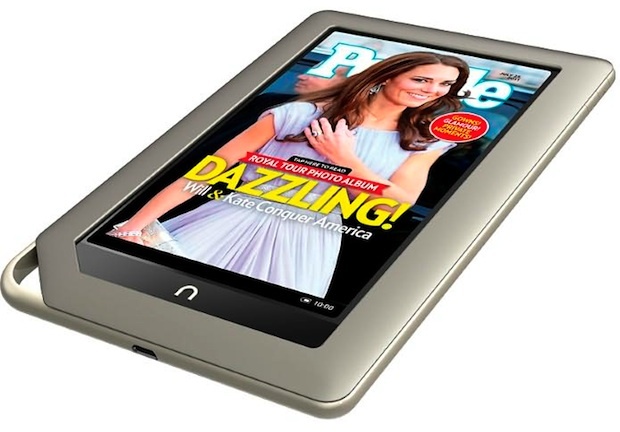 Following the launch of NOOK 3G a year ago, and NOOK Wi-Fi last summer, Barnes & Noble continues to enhance the overall reading experience and performance of its award-winning, best-selling NOOK E-Ink devices. A major update coming in November will dramatically increase the page-turn speed, and deliver the most-requested features and performance enhancements from NOOK customers, including improved search functionality, customized Barnes & Noble Library organization, password protection and continuous reading across all NOOK devices and software. NOOK version 1.5 software will be available at no cost next month for all current and new NOOK owners via Wi-Fi or manual download at www.NOOK.com/support. Barnes & Noble’s NOOK brand of eReading products makes it easy to read what you love, anywhere you like with a fun, easy-to-use and immersive digital reading experience. With NOOK, customers gain access to Barnes & Noble’s expansive NOOKbook Store of more than two million digital titles, and the ability to enjoy content across a wide array of popular devices. 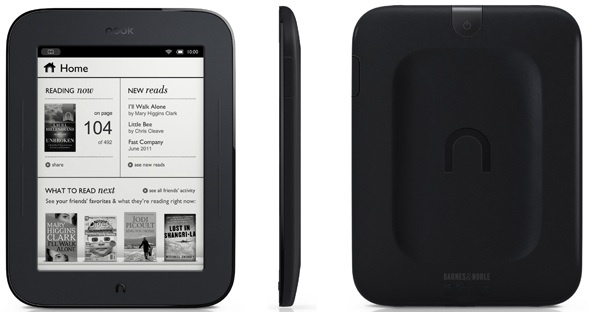 NOOK products are the most full-featured, dedicated eReading devices on the market. NOOKcolor ($249), the first full-color touch Reader’s Tablet, provides the ultimate reading experience with a stunning 7-inch VividView Color Touchscreen to read all of the content you love. For book lovers, NOOK 3G ($199) and NOOK Wi-Fi® ($149) offer a paper-like reading experience with a color touch screen for navigation. In Barnes & Noble stores, NOOK owners can access free Wi-Fi connectivity, enjoy the Read In Store feature to read NOOKbooks for free, and the More In Store program, which offers free, exclusive content and special promotions. Barnes & Noble was the first company to offer digital lending for a wide selection of books through its LendMe technology, available through NOOK eReading products. 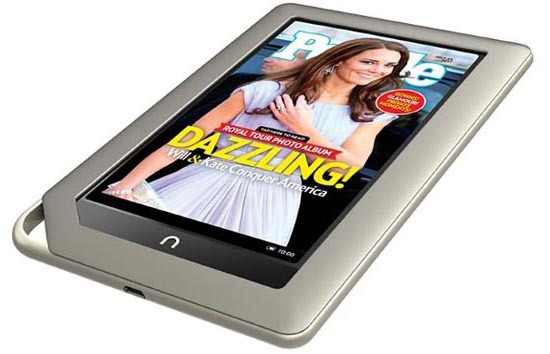 Find NOOK devices in Barnes & Noble stores and online at www.NOOK.com, as well as at Best Buy, Walmart and Books-A-Million. In addition to NOOK devices, Barnes & Noble makes it easy for customers to enjoy any book, anytime, anywhere with its free line of NOOK software, available at www.bn.com/NOOKapps. Customers can use Barnes & Noble’s free eReading software to access and read books from their personal Barnes & Noble digital library on devices including iPad, iPhone®, iPod touch®, Android, BlackBerry® and other smartphones, PC, and Mac®. Lifetime Library helps ensure that Barnes & Noble customers will always be able to access their digital libraries on NOOK products and software-enabled devices and BN.com. Barnes & Noble also offers NOOKstudy (www.NOOKstudy.com), an innovative study platform and software solution for higher education and NOOK kids (www.NOOKkids.com), a collection of digital picture and chapter books for children.